George Clarke received his illuminated certificate from APGM John Pearson. Very recently I had the great pleasure of attending Kershaw Lodge No 3838 which meets at Ashton Masonic Hall. 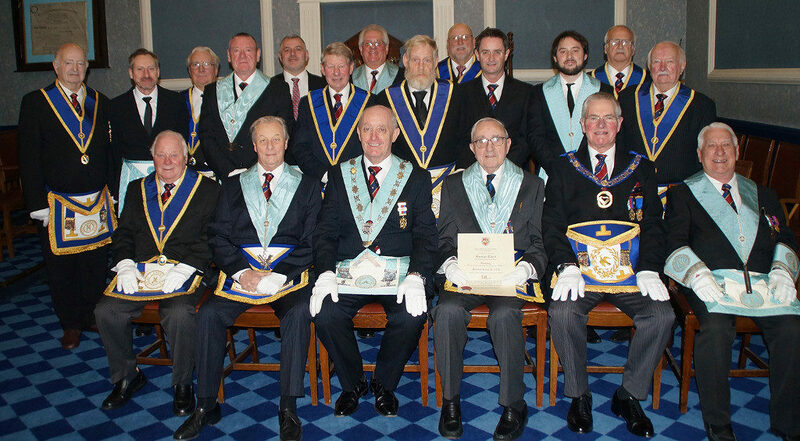 We, (that is I and very close to 50 other Masons, went along to help celebrate George Clarke’s 50 years in Freemasonry, and as a member of Kershaw Lodge. WBro John Pearson, the APGM for the Southern Area was in attendance with a full District Team and was paraded into the Lodge with the usual level of precision that you can expect to find in an East Lancs Lodge. John took the Chair and introduced the team that were in attendance with him. Then George was brought out to the centre of the room so that he would be the focus of the meeting. The Secretary, Brian Bell then read us an extract from the Minute Book covering the 14th January 1969. That was the night when George was initiated and first became a member of Kershaw Lodge. George joined Kershaw Lodge the year after their 50th Anniversary, and he has been at the heart of the Lodge ever since. His record and his commitment to Kershaw is shown in any examination of the records. He has conducted 5 Installations, 14 Tracing Boards, 7 Initiations, 4 Passings, 4 Raisings and numerous Address’s and presentations. George has served as WM of the Lodge on six occasions, he was Secretary for 11 years and Chaplain for another five. His record in the Royal Arch is every bit as notable. 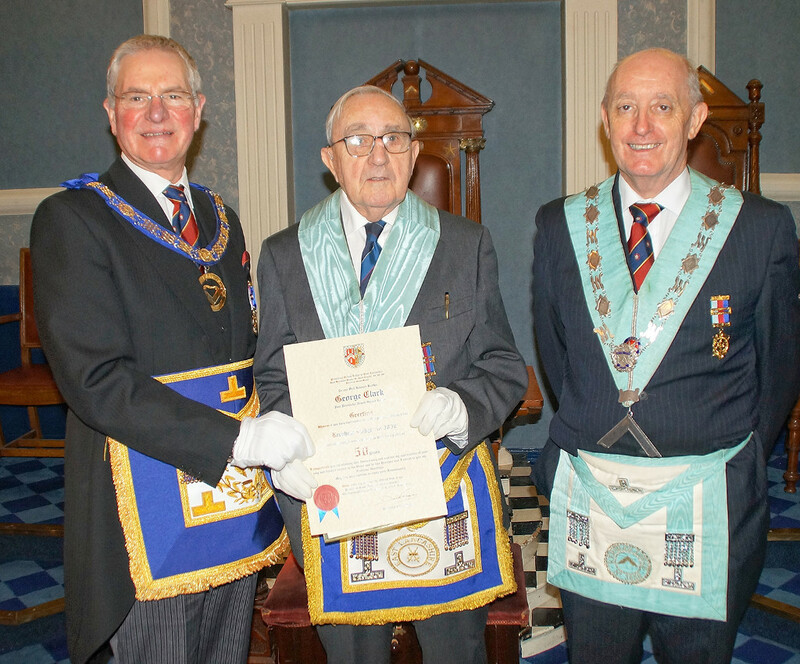 John Pearson then presented George with a copy of an illuminated certificate from the Provincial Grand Master, marking his fifty years, and George was paraded around the Lodge to the approbation of all those present. Finally, we went downstairs where we enjoyed a superb celebratory Social Board. Kershaw Lodge is a happy lodge and benefits from the presence of Brothers like WBro George Clark PProvGSwdB. All of the photographs taken on the night can be found in a Gallery on the Provincial Server. © Photographs and Text Copyright to Kevin Hall, District Communications Officer. the express written permission of the copyright holder.